Brunton F-5007 ComPro pocket Transit with single NdFeB magnet and Sapphire jewel bearing. Fully scaled in 4 quadrants of 0-90°. With a body made of composite materials, the Brunton 5007 Transit is a lighter, more affordable alternative. It incorporates a cast NdFeB rare-earth magnet, precisely balanced on a sapphire bearing, resulting in a powerful magnet, which quickly seeks magnetic north and permits faster readings. The Brunton Pocket Transit provides 1° resolution. All Brunton Pocket Transits are hand-built and pass a rigorous 100% quality assurance inspection for 1/2° accuracy, both vertically and horizontally. Rotate the pocket transit so the flat cover side faces up, and the small window is positioned away from you. Unlatch the cover from the base of the transit. 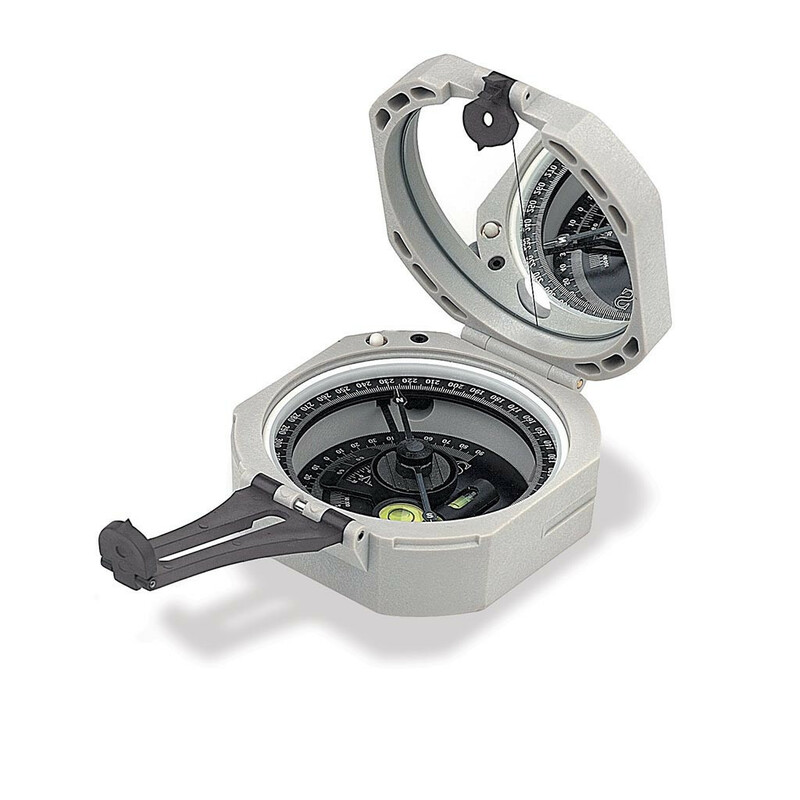 The Brunton Pocket Transit is a direct reading compass. The needle points directly to the bearing on the azimuth ring, which is graduated counter-clockwise. There two ways to take a direct reading: 1) point the large sight toward the object, and read the bearing where the 'N' or white tip of the needle points to the azimuth ring, or 2) point the small sight toward the object and read the bearing where the 'S' or black tip of the needle points to the azimuth ring. If the bearing of the object is 45° from true north, for example, the needle will point between N and E on the bottom plate. The bearing will be the same using either method. Try it! Yes, you can. If your location is near, or south of the balance lines, the needle on your Brunton Pocket Transit requires special balancing. Contact ASD if you are uncertain or your transit requires special balancing. What are some differences between Brunton's Pocket Transits? The Brunton Company warrants the ComPro Transit to be free of defects in materials and workmanship for one year. Brunton also warrants the ComPro against any damage incurred during use. This warranty is extended to the original purchaser only.